NASA's Juno spacecraft is set to launch today (Aug. 5) on a mission to study the origin and evolution of the planet Jupiter, the solar system's largest planet. Juno is slated to blast off atop an unmanned Atlas 5 rocket at 11:34 a.m. EDT (1534 GMT) from Cape Canaveral Air Force Station in Florida. 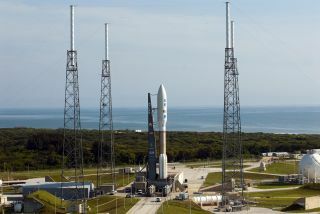 The forecast calls for a 70 percent chance of acceptable weather conditions for a Friday launch, NASA officials said, even though Tropical Storm Emily is making its way toward Florida's Space Coast. Juno's launch will mark the start of a long, circuitous trip through the solar system. The probe is expected to arrive at Jupiter in July 2016. Scientists expect the payoff to be well worth the long journey. "What we're really going after is some of the most fundamental questions of our solar system — how Jupiter formed, how it evolved, what really happened early in the solar system that eventually led to all of us," said Juno principal investigator Scott Bolton, of the Southwestern Research Institute in San Antonio. That's part of the reason scientists are so interested in the gas giant. Understanding how and when Jupiter formed, they say, could teach them a great deal about planet formation in general and the evolution of the solar system. So the $1.1 billion Juno mission will peer at Jupiter from above, studying the huge planet's structure, composition and magnetosphere, among other things. For example, the spacecraft will measure the amount of water in Jupiter's atmosphere. A super-wet Jupiter might suggest that the planet formed farther out in the solar system, then migrated into its present position. Juno will also measure Jupiter's magnetic and gravity fields, to help determine whether it has a solid core of heavy elements. And the probe will get a great look at Jupiter's auroras — phenomena that are also common to Earth, where they are known as the northern and southern lights. "This will be the first time anyone has flown over the poles of Jupiter to look directly down on the aurora," Juno co-investigator Fran Bagenal, of the University of Colorado, said in a statement. "We will be flying the spacecraft through regions where charged particles are accelerated to the point of bombarding the atmosphere of Jupiter hard enough to make it glow at the poles." Juno will be powered by the sun, boasting three solar arrays the size of tractor-trailers. It will be the first solar-powered spacecraft to make it out to Jupiter's locale, nearly 484 million miles (779 million kilometers) from the sun. The probe will study Jupiter for a full Earth year, making 33 orbits. At the end of that period, Juno will die a dramatic death, crashing into the giant planet. Mission scientists planned the crash to make sure the spacecraft doesn't accidentally slam into (and therefore contaminate) any of Jupiter's moons, some of which may be capable of supporting life. Researchers have high hopes for Juno's mission and expect some exciting surprises.